Happy Halloween from the District of Hockey! 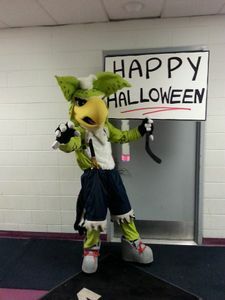 In any case we were excited to be asked to supply both Gizmo and Spike suits for our favorite hockey mascot, Slapshot the Eagle of the Washington Capitals. To put the scare in the Detroit Red Wings the team introduced a diminutitive, boxed Gizmo-Slapshot on the video board with the ominous instructions echoing against the sea of red Caps fans.... "Don't get him wet, keep him out of bright light, and never feed him after midnight." ...and then Slapshot burst onto the ice in his Spike attire. If we can help suit you up for a special occasion, theme, or crazy stunt please don't hesitate to ask! Crazy ideas are what we SCARE for.